"The General, ever desirous to cherish a virtuous ambition in his soldiers, as well as to foster and encourage every species of military merit, directs that, whenever any singularly meritorious action is performed, the author of it shall be permitted to wear on his facings, over his left breast, the figure of a heart in purple cloth or silk, edged with narrow lace or binding. Not only instances of unusual gallantry, but also of extraordinary fidelity, and essential service in any way, shall meet with a due reward. Before this favour can be conferred on any man, the particular fact, or facts, on which it is to be grounded, must be set forth to the Commander-in-Chief, accompanied with certificates from the Commanding Officers of the Regiment and Brigade to which the candidate for reward belonged or other incontestable proof; and, upon granting it, the name and regiment of the person with the action so certified, are to be enrolled in the Book of Merit, which will be kept at the Orderly Office. Men who have merited this distinction to be suffered to pass all guards and sentinels which officers are permitted to do. The road to glory is thus opened to all. This order is also to have retrospect to the earliest stages of the war, and to be considered as a permanent one." Preliminary articles were signed at Paris between Britain and the United States on November 30, 1782. And on September 3, 1783, the United States and Great Britain signed a definitive agreement to be known as the Treaty of Paris, in which Britain recognized the independence of the United States. The American Revolution began as a civil war on April 19, 1775, when fighting broke out at Lexington and Concord, within the British Empire. It escalated into an international war when France became an ally of the United States in 1778, Spain in 1779 and the Netherlands in 1780. But, the Revolutionary War came to an end, and the fighting stopped, and the Order of the Purple Heart vanished from public view. Seventy-seven years later, in the general election on Tuesday, November 6, 1860, the Republican ticket of Abraham Lincoln of Illinois and Hannibal Hamlin of Maine received 39.9% of the popular vote, the plurality in the four-ticket race. But following the vote count, a troubling fact emerged. Lincoln and Hamlin had not received a single vote in 10 of the Southern states. On December 5, 1860, when the Electoral College met to cast their ballots, storm clouds of secession were reverberating over the Union. South Carolina was the first to secede on December 20, 1860, followed by Florida, Mississippi, Alabama, Georgia, Louisiana and Texas on February 1, 1861. On February 13 Electoral College ballots were officially counted giving Lincoln and Hamlin 180 of 303 electoral votes, and legal standing as public officials over a divided Union. Cabinet posts and other appointments were well under way as the new administration prepared to take the reins of government. 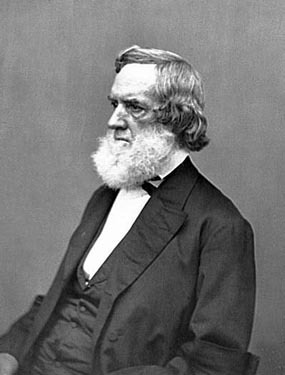 The appointment of Gideon Welles to the cabinet post of Secretary of the Navy was an easy and undisputed choice of both Lincoln and Hamlin. Welles had served as chief of the Bureau of Provisions and Clothing for the Navy from 1846 to 1849. His assistant was Gustavus Vasa Fox, a graduate of the U.S. Naval Academy at Annapolis, Class of 1841. Fox a former lieutenant had served 15 years in the U.S. Navy. On March 4, 1861, in Washington D.C., Chief Justice Roger B. Taney, brother-in-law of Francis Scott Key, administered the oath of office to the 16th President of the United States. On the day Lincoln took the oath of office, the U.S. Navy was in a demoralized condition. The Navy's 1,457 officers and 7,600 men were scattered around the world, and of the 90 ships in service, less than half were ready for active duty. Sixteen captains, 34 commanders, 76 lieutenants, and 111 regular and acting midshipmen had defected to the South, and Gideon Welles, the newly appointed Secretary of the Navy, was searching for ways to inspire sailors, and promote the efficiency of the Navy. On Tuesday morning following the inauguration, Lincoln arrived at his desk to find a report from Major Robert Anderson, commander of the garrison at Fort Sumter. He stated in his report that provisions at the fort would be exhausted in approximately six weeks. He requested resupply, or he would be forced to surrender, and warned that 20,000 troops were needed to secure the fort. Forty days into Lincoln's first 100 days in office at 4:30 a.m. on Friday, April 12, 1861, while the Union fleet lay offshore preparing to resupply the garrison at Fort Sumter, Confederate onshore batteries began bombarding the fort. Located on a man-made island at the entrance to Charleston Harbor, Fort Sumter was under siege, and would remain so for thirty-four hours before Major Anderson and his garrison surrendered. Fort Sumter was the first battle, and the curtain raiser for the American Civil War. In 1861 Lieutenant Colonel Edward Davis Townsend was assigned to the Adjutant General's Office in Washington D.C. as assistant to the Adjutant General, Brigadier General Lorenzo Thomas. Townsend recommended the creation of a medal for valor, but General-in-Chief of the Army, Winfield Scott, rejected Townsend's idea. General Scott was strongly opposed to the European custom of awarding medals for heroism, but Secretary of the Navy Gideon Welles was not. He liked Townsend's idea, and thought it would inspire sailors, and help to promote the efficiency of the Navy. "The report of the Secretary of the Navy presents in detail the operations of that branch of the service, the activity and energy which have characterized its administration, and the results of measures to increase its efficiency and power. Such have been the additions, by construction and purchase, that it may almost be said a navy has been created and brought into service since our difficulties commenced. "Besides blockading our extensive coast, squadrons larger than ever before assembled under our flag have been put afloat and performed deeds, which have increased our naval renown. "I would invite special attention to the recommendation of the Secretary for a more perfect organization of the navy by introducing additional grades in the service. "The present organization is defective and unsatisfactory, and the suggestions submitted by the department will, it is believed, if adopted, obviate the difficulties alluded to, promote harmony, and increase the efficiency of the navy." Senator James Wilson Grimes, Republican from Iowa, introduced Senate Bill 82 on Monday, December 9, 1861. It was mainly a bill to promote naval efficiency, and included a statement authorizing, "the Secretary of the Navy to cause two hundred 'medal of honor' to be prepared, with suitable emblematic devices, to be bestowed upon such petty officers, seamen, landsmen, and marines, as shall most distinguish themselves by their gallantry in action and other seamanlike qualities during the present war…." Senate Bill 82 was referred to the Senate Committee on Naval Affairs on December 9, and reported out of committee on December 12 with amendments. It passed the Senate with the amendments on the third reading, and was sent to the House. It was taken up in the House on December 16, and referred to the House Committee on Naval Affairs. It was reported out of committee on December 17 with amendments. It passed the House with the amendments on December 18, and was returned to the Senate. Senate Bill 82 passed the Senate with the amendments on December 18. The Speaker of the House, Galusha Aaron Grow, signed the enrolled bill on December 19. The President of the Senate, Vice President Hannibal Hamlin, signed the enrolled bill on December 20. 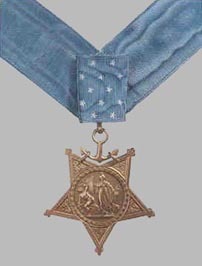 On December 23 John Nicolay announced in a message to Congress that the President had approved and signed Senate Bill 82 into law on December 21, 1861, to further promote the efficiency of the Navy, and create the Navy Medal of Honor. The original purpose of the Navy Medal of Honor—"To further promote the efficiency of the Navy"—was broadened to include recognition for "deeds of gallantry and heroism in times of War and of Peace." Secretary of the Navy, Gideon Welles delegated the design and crafting of the Medal of Honor to the Director of the Mint, James Pollock. And, it was symbolically designed and crafted by the artist Christian Schuller. Schuller designed and crafted the badge as an inverted five-point star-shape of bronze. At the center is a figure of Minerva, the Roman goddess of handicrafts, the professions, the arts and later of war. She symbolized the Union, "wise in the industries of peace and the arts of war." An owl perched on her helmet, symbolized wisdom. In her left hand she held the fasces, a badge of authority. She held a shield in her right hand, which symbolized the Union of our states, and wielded the shield to drive off the serpents held by the crouching figure of Discord. In a letter to Gideon Welles dated May 6, 1862, James Pollock referred to Discord as, "the foul spirit of secession and rebellion." Thirty-four stars encircled the allegory. The stars represented the 34 states before secession of the 11 Confederate states. On each point of the star-shape badge laurel leaves were mixed with a cluster of oak, which symbolized victory, honor and strength. The symbolic devices emblazoned in bronze epitomized the confusion and dissension rampant in America in 1861. The star-shape badge was suspended from a ribbon with a field of blue leading from the clasp to 13 vertical stripes, alternating red and white like the 13 horizontal stripes of the flag. The stripes may stand for the original 13 colonies, as does the stripes in the flag of the United States, and the colors of the ribbon may have meaning or symbolism. When the "Stars and Stripes" was first flown at the head of the Continental Army, General George Washington said: "We take the stars from Heaven, the red from our mother country, separating it by white stripes, thus showing that we have separated from her, and the white stripes shall go down to posterity representing liberty." Meaning or symbolism has never been officially assigned to the colors of the flag. However, Charles Thomson of Pennsylvania, secretary of the Continental Congress, when describing the Great Seal related its colors to those of the flag: "White signifies purity and innocence, Red, hardiness and valour, and Blue … signifies vigilance, perseverance and justice." On March 3, 1915, on the day of adjournment of the Third and final session of the 63rd Congress, an extract from "An Act Making Appropriations For The Naval Service For The Fiscal Year Ending June 30, 1916, And For Other Purposes", stated, "The President of the United States is hereby empowered to prepare a suitable medal of honor to be awarded to any officer of the Navy, Marine Corps, or Coast Guard who shall have distinguished himself in battle or displayed extraordinary heroism in the line of his profession." The Act was passed on March 3 making officers of the Navy, Marine Corps, and Coast Guard eligible for recommendation to the Department of the Navy for the Navy Medal of Honor. The Department of the Navy had recognized non-combat heroism with Medals of Honor since its inception on December 21, 1861, but the Act of February 4, 1919 created a separate Medal of Honor for non-combat heroism. The medal was designed by Tiffany & Company of New York, and known as the Tiffany Cross. But the two-medal system proved unpopular, and on August 7, 1942 an Act restored the earlier provisions of the Navy Medal of Honor for non-combat heroism eliminating the Tiffany Cross and the two-medal system. Since its inception, the appearance and purpose of the Navy Medal of Honor has evolved, but Christian Schuller's design of the star-shape badge has remained the same. The anchor from which the badge is suspended is no longer encircled with twisted strands of anchor cable. A pale blue ribbon with clasp is worn around the neck, and decorated with a pattern of 13 stars above the anchor, and the stars rather than stripes may now stand for the original 13 colonies.